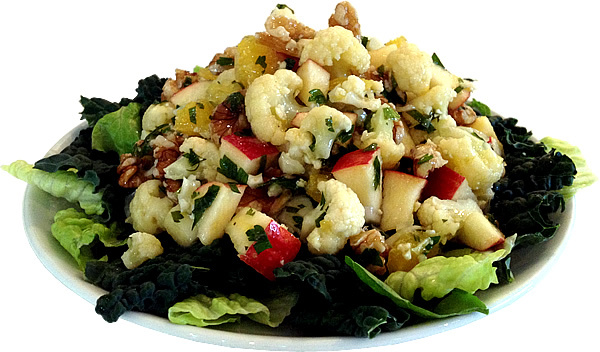 This marinated cauliflower salad recipe will satisfy your appetite and your taste buds. Raw foods retain all of their available vitamins and minerals, with none being sacrificed to the cooking process. Raw veggies and fruits contain natural enzymes which help our bodies to digest food and make it available to our cells and to convert into energy. This raw salad takes crunchy cauliflower and infuses it with fresh, interesting flavours. The walnuts and apple give it a ‘Waldorf’ slant, which is never a bad thing! This salad truly gets better with age and keeps well in the fridge for a couple of days. Carefully peel the orange over the bowl you will be using to marinate your salad, to catch all the orange juice. Peel off as much of the pith as you can, and then cut between the orange segments to remove the juicy flesh from the segment skin. When you have cut out all the orange segments, squeeze the remaining orange ‘skeleton’ to extract all the remaining juice, then discard the ‘skeleton’. In the serving bowl, cut the orange segments into smaller, bite size pieces. Add all the remaining ingredients to the bowl and mix thoroughly, making sure the oil and citrus juices combine with all the other ingredients. Cover the bowl and allow to marinate for at least 4 hours and as long as 2 days. If you are marinating for use the next day, pop it in the fridge. When you are ready to eat, simply serve on top of leaves. If you are using kale leaves, you can include these at the marinating stage if you like. This salad is full of flavour and worthy to eat on its own, but also tastes great with strips of chicken and/or bacon in it. Feta cheese crumbled on top of it works really well with the flavours too.